On April 11 I wrote a 30 by 30 list and thought I would have a look at it today to see how I am doing. I am starting off with the small things as a couple of them I will really need to save for, but so far I am on track to completing a couple of them soon which is exciting. #3 Learn to surf has been on my 'to do' list for ages. Not long after I wrote my list a deal came up on Groupon where I could do a day learn to surf class at Manly which was exactly what I wanted. My sister wanted to do it too so I grabbed 2 tickets and because I had a discount voucher for Groupon as well it only cost $8. She has now moved to QLD so I need to convince someone else they want to learn to surf for a day. I am excited because there is now a deadline for me to do this as the coupon will expire and I am cheap, so don't want to spend if I don't have to. #5 Raise $10,000 for a charity - I think I have decided which one. I love Kiva as their micro loans really help communities and if I raised $10,000 to be donated there it could be used over and over and over again. I think it would help the most amount of people possible. #11 Do a 365 Day gratitude project - so far so good. I will finish it on my birthday, but it is helping me be more appreciative of people/events/things in my life. #14 Couch to 5km run - I haven't actually started officially but I am now walking 4 - 8kms a day at least 3 times a week and I have been trying to run some of it, and gradually building on it. So while it is not the same as doing it officially I am raising my fitness levels and will be incorporating the couch to 5km run into my 'daily' walk in the next few weeks. #16 Finish my dream bedspread - I have 1 pillow case to go and it's done! 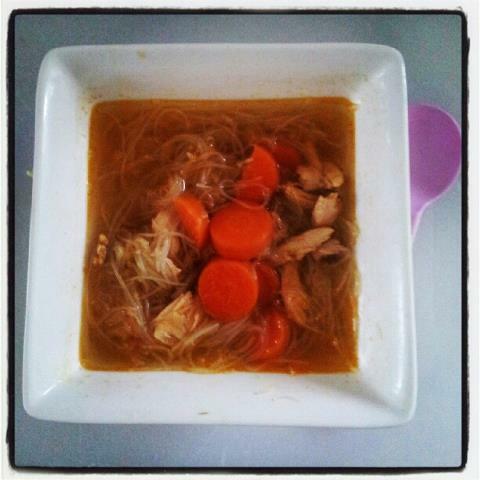 #21 Do 101 random acts of kindness - this has been incredibly easy. Simple things like letting the mum with her 2yr old waiting in line go in front of me as I know what that's like, waiting with a kid who doesn't want to be there. Letting others in when driving, asking a parent if their child would like a turn on the $2 rides because I am putting it on for my kids anyway, may as well fill it up. Things like that are just second nature to me and it is only yesterday I realised just how often I do stuff like that. I am considering changing this one a little and instead of random acts, plan some slightly bigger acts like dropping off a hamper to someone, doing someone's gardening it etc. What are your thoughts/suggestions? #25 Finish my 2 eBooks - one is done, just waiting on the cover art/promo buttons and then it will be launched with a bloggy tour etc. The other will be launched July 1st, 2012. #29 Read 30 books I have, waiting to be read - I have read 3 so far and it has been great to finally get them read and learn so much. The one I am reading at the moment is a business type book and it is so fascinating and there is so much to learn I can only read small bits at a time in order to absorb it properly. I love inspirational thoughts, quotes and things to help motivate you. I loved it, but decided to buy it later. As I thought about it more I realised I would prefer it stamped onto a piece of jewellery and would be more likely to wear a bracelet or cuff. One of my awesome sisters suggested Etsy and I have been able to order not only the above quote but a few others I love. If ind having little reminders around me like this help me stay positive and can change my view on a situation. Another of my favourite things is Pinterest, where I can find great quotes and things. I have a whole board on inspirational quotes, some of which I have printed out and put up on my walls. This week I have been walking my daughter to and from school. On the way I was pleasantly surprised to discover some great inspiration for our garden. We have wanted to do our garden for some time. I wanted a mix of tropical and edible plants. We want plants in the front to reduce the size of the lawn as it takes quite a while to mow and a front garden would look much nicer than the big stretch of lawn we currently have. I have been growing a few things from seed such as carrots, herbs and strawberries to have in our back yard and I wanted to do something practical but pretty with our front yard. Since I don’t plan on staying here long term I also did not want to invest a lot of money into it and not really reap the rewards of my efforts. 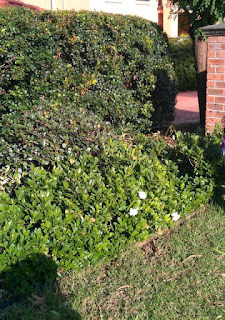 I know the picture is not fantastic but it is a LillyPilly hedge (fast growing, edible berries and great for screening), with bilberry bushes in front, followed by gardenia’s. I love that there are 2 native berry bushes, the leaves are thick and while it is not tropical like I wanted, it blends really nicely with the area. 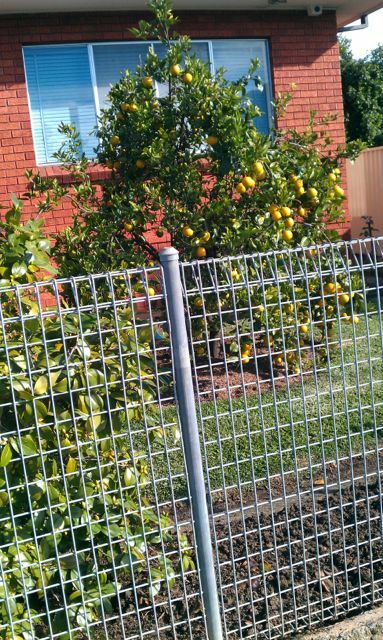 Another thing that surprised me as I was walking around was the amount of people who have fruit trees in their front yard. It makes sense because you don’t want to waste the space, but I was always worried about fruit being pinched. As you can see here it doesn’t seem to be a problem. 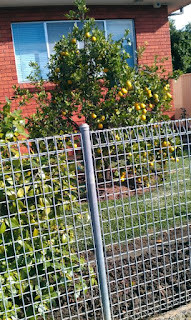 This house actually had 4 orange trees and a few houses down was another house with apple trees out the front. All the trees were fruiting, yet still full. I saw, but didn’t get a picture of a garden lay out I like which could incorporate all aspects of the above and a bit of the tropical look I would like. It also had some plants in pots, which would be easy to move. My mind is now buzzing with ideas of what I could do to make the yard inviting, but practical and useful. What do you have in your garden?